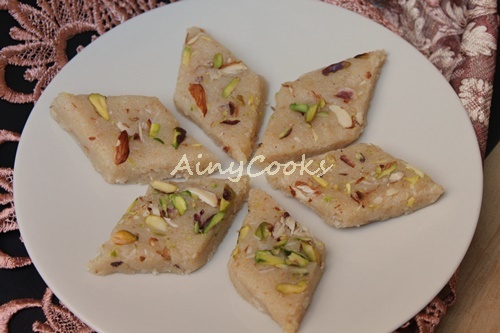 I have tasted this delicious halwa at my Aunt’s house. 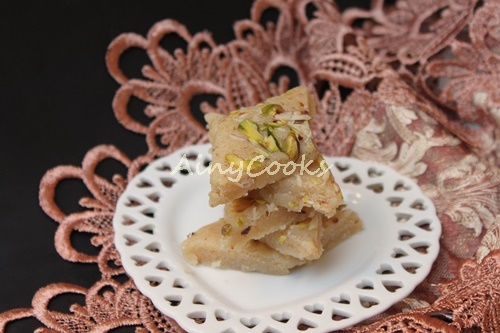 My sister in law Sadia Khalil, made this halwa and believe me it was not only delicious but super easy. 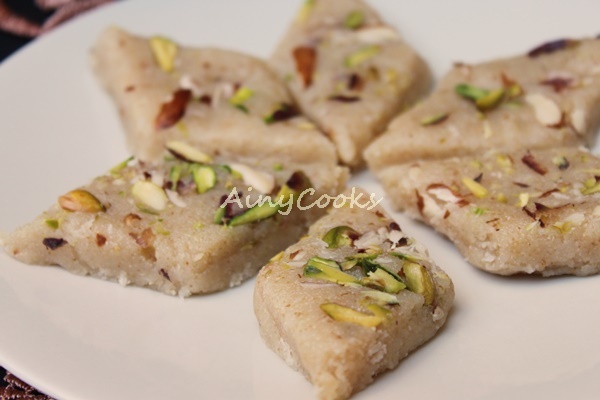 She made this with gram flour too. Aroma of gram flour was divine. In a bowl mix milk powder, sugar and coconut. Mix them with 1/2 cup milk, we just need to mix all ingredients. Set aside. In a pot add ghee and Ilaichi /cardamom seed, stir and let them crackle. Now add Suji and fry till nice smell appear. 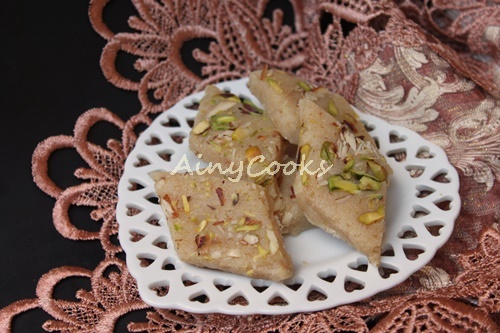 You can take gram flour 1/2 cup instead of semolina /suji too. Add coconut mixture in it and stir vigorously. As soon ghee separates or halwa leave sides of pot spread in greased tray. Spread evenly. Sprinkle almonds and pistachio. Let it cool a bit and cut diamond shape or any shape of your choice. Serve or store in airtight box and keep in refrigerator. Can I just clarify if the recipe means to add liquid milk to the mix of dried milk powder sugar and coconut? I am sorry it was missed, you can take 1/2 cup milk if need more to mix than add more milk. Love reading your blog especially about your mum. May Allaah grant her Jannah. My daughter made your easy fudge was fabulous.